Q1. What is included in the scholarship application process? 3) A listing of the applicant’s involvement in his/her community including work experience & volunteer activities. Q2. Can I submit a paper copy of my application rather than complete the process online? Answer: To ensure all applications are received and made available to all members of the selection committee, only online applications will be accepted. Q3. What is included in application sections: “School Involvement” and “Community Involvement”? Answer: School Involvement: The selection committee will review each student’s list of school related activities. The list should include involvement in all “structured activities” such as clubs, organizations, teams, etc. In addition, be sure to include involvement in “non-organizational activities” such as tutoring, assisting teachers, volunteer services, committee membership, etc. It is also important to list any leadership positions such as serving as an officer, captain, etc. Community Involvement: Include a list of non-school involvement activities such as involvement in church, civic organizations/clubs, and other volunteer services. In addition, this section provides each applicant an opportunity to document employment and/or military experiences, and family responsibilities. Include the amount of time spent and duties performed. Q4. Does the application require a transcript? Answer: Yes. The academic record for each applicant may be taken into consideration as part of the selection process for some, but not all, scholarships. Applicants who are currently enrolled at Forest Lake Area High School will not have to include a transcript--the high school will download this information into each student’s application. 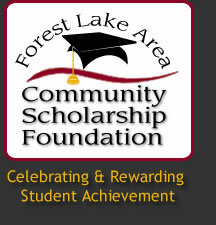 Applicants not currently enrolled at Forest Lake Area High School must submit a current transcript with their application in order to be considered for a scholarship. Q5. How do I get help with my application?